One thing we know for sure is that executives of big corporations have never been fond of salaried or hourly employees. The reason is simple: They cost too much. Costs include wages, health insurance and other benefits, savings plan contributions, payroll taxes, workman’s compensation, labor lawsuits, and so on. There is even the cost of executive’s time and patience. Executives find employees to be generally difficult to deal with, slow to execute on their plans, and, of course, responsible for any problem that may arise. As a result, executives are constantly on the hunt to replace employees with technology. What they usually do not realize is that the total cost technology is expensive and it is usually inflexible when conditions change. The solution, obviously, is more technology, along with the hiring of additional highly paid employees to manage the technology. Pragmatism suggests that it is wise to balance human work and technology work, which means employees will remain integral to the successful functioning of an organization. Why not, then, take actions that help employees prosper at while reducing the total cost of employees, particularly as it relates to healthcare – and also as it relates to innovation, productivity, and responsiveness to changing conditions. Blame, humiliation, fear of layoffs, micromanaging, unknown expectations, overlapping roles and responsibilities, office politics, confusing direction from management, and other organizational maladies common in conventional management, make employees feel like they are not in control and exposes them to high levels of stress on a daily basis, which, in turn, harms employees’ mental and physical health. Over time, chronic stress caused by chaotic batch-and-queue material and information processing can lead to atherosclerosis, hypertension, abdominal (visceral) fat, chromosome damage (telomeres unravel), weakened immune system, hippocampal atrophy (learning and memory center in the brain), neuron (nerve cell) damage, fear, anxiety, and depression. This affects managers as well as employees. Business, and those who lead it, should not cause harm to human health and well-being. 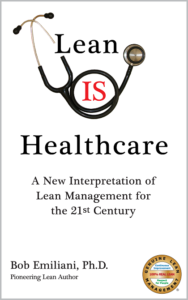 I described this in an e-book I wrote and published in 2012 titled Lean IS Healthcare. As is often the case, my work was ahead of its time. The book did not sell well, and so I unpublished it in 2015. But the salient, most impactful chapters were been re-published in Lean Is Not Mean (Lesson 66, “People and Processes;” Lesson 67, “Healthcare In Lean;” and Lesson 68, “Don’t Be a Stress Raiser”). You should read it. “Kaizen, done right, gives employees more involvement and say in what they do, and a sense of reward for their efforts. It humanizes the workplace and improves cross-functional teamwork, communication, and enthusiasm for work. Kaizen creates a better social environment and temporarily erases hierarchies. It promotes social affiliation and helps leaders to better understand the work that employees do (and vice versa, where employees participate in kaizen for managerial processes)…. So, think of kaizen – kaizen forever – as a simple and low-cost employee wellness strategy. Kaizen has so many positive knock-on effects that you will soon view the common methods once used to improve employee health and wellness as both haphazard and limited in their effectiveness. Kaizen, of course, is not a cure-all, and Lean businesses will always have problems. However, batch-and-queue businesses have many more problems. Healthcarelessness is everywhere in conventional management. Instead, switch to a management practice where mental and physical healthcare is built-in. Brilliant article. I will try to get as many people in the UK to read it as possible. What you describe as the problems in the Management / worker relationship and wasteful use of technology is rampant here in UK. Our train and metro transport systems as one example…to many ticket machines ( with queues), ‘automated’ entry/exit barriers ( with queues)…and workers standing by to ‘watch them’ but impotent to make sensible decisions. Thank you John. I appreciate your help in sharing this with others. Bob, you always get it completely! A lean environment is happy and healthy for all. Traditional management isn’t wired to this kind of thinking, and they’re lacking the awareness necessary to comprehend the wisdom you have bestowed upon us. Thanks, Bob.